Duplicate Sho~Bud waterslide decal to go on the left front (changer end) of the cabinet. 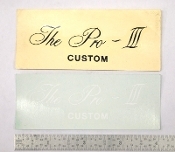 Duplicate Sho~Bud "The Pro-III Custom" waterslide decal to go on the right front (key head end) of the cabinet. 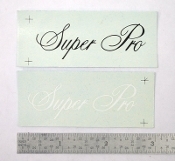 Duplicate Sho~Bud "Super Pro" waterslide decal to go on the right front (key head end) of the cabinet. Duplicate Sho~Bud "LDG" waterslide decal to go on the right front (key head end) of the cabinet. Duplicate Sho~Bud vinyl adhesive backed decal. This is a smaller version of the cabinet logo. I do not know where it may have been used but it may work well on the side of a Sho~Bud volume pedal. Duplicate Sho~Bud "The Professional" waterslide decal to go on the right front (key head end) of the cabinet. Duplicate Sho~Bud foil adhesive backed decal. This is the one used on the face of the pedal bar.